We met Massimo Marinacci at the Primavalle market in Rome. Massimo is the membership coordinator in the northern part of Lazio for Banca Etica, a bank that hardly resembles any other financial institution in Italy. As Massimo passionately explains, Banca Etica’s strength lies in its popular and cooperative nature. Indeed, it is entirely run and controlled by its shareholders, who select new members and clients on the basis of social, environmental, labor, and governance standards. Banca Etica thus manages to make us hope for better banking models, which are motivated by a social justice rationale, and not by the prospect of accumulating wealth. Banca Etica is a bank that offers the same services and products of other banks. The difference however lies in the fact that Banca Etica is a bank for the people and of the people. Its property is in the hands of 40.000 associates, 36.000 of them being actual people while the rest is composed of legal persons. Another element that distinguishes Banca Etica is the importance given by the bank’s statute to the source of monetary funds and the non-economic consequences for financing. Banca Etica is a cooperative and community bank. There are many of them in Italy like the “Cooperative Credit” ones, which operate in small regions. In 1997, when Banca Etica was founded, the idea was to work on a national scale, therefore overcoming the regional divisions of the cooperative credit banks. Banca Etica was indeed born as a community bank based on the principles of a cooperative, in which the associates purchase the bank’s shares, and in the general assembly, no matter the number of shares owned, the vote works with the ‘one person one vote’ system. Moreover the shareholders obtain a small economic advantage as they are offered lower interests on some of the services offered by the bank. The GIT, territorial initiative groups, can be created in every province where more than 200 shareholders are registered. These are groups formed by active shareholders who are willing to promote our ethically oriented finance, our projects and our principles. Unfortunately, the lack of knowledge of economic concepts and the risks and opportunities that derive from financial activities have led to terrible international economic crisis. Our shareholders are different because they value the quality of their investments over the quantity of money they could potentially gain. They think of money as a mean to develop tangible projects and not as an end in itself. The GIT are therefore groups composed of voluntary members, who have the chance to participate in specific classes offered by the bank and acquire the professional skills needed to do marketing. Members also participate in the bank functioning by attending the local assemblies and the members coordination committees. Among the active members, the so-called “social evaluators” are in charge of carrying out a thorough analysis of the social and environmental characteristics of the projects to be financed. As a matter of fact, Banca Etica does not only apply the traditional economic evaluation procedures – mandatory according to Bank of Italy’s regulations – it also evaluates social and environmental standards thanks to the questionnaires and interviews conducted by its members. This means that we are very aware of the persons we finance and we seldom engage with dishonest clients. Banca Etica’s default rates are only one fifth of the Italian banking system even if we are on average more willing to finance those people that 10 years ago wouldn’t even have been considered financeable. What are some examples of local projects that you have financed? This is a field in which we don’t have a lot of experience. We indeed have very limited resources and we are forced to prioritize certain activities over others. However, we always try to take into account the historical and societal context in which we are moving. For instance, 15 years ago we refused to finance for profit projects. Nowadays, considering the issues of unemployment, we value any working activity more. Hence, we discovered a world of profit realities that meet the criteria of corporate social responsibility. In particular, we are supporting a new phenomenon known as the “Workers Buy-Out” is gradually inspiring more and more people, encouraging workers to gather in a cooperative and buy out their business after a bankruptcy. We have financially supported the project of a group of workers from the city of Pomezia, who bought back the company they worked for. They produce office furniture and 80% of their business is made abroad. After the failure of the company, due to some events unrelated to the market of reference, 40 workers were left without a job. 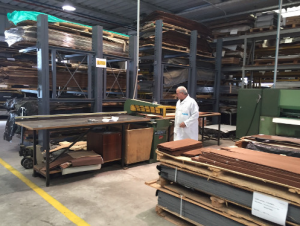 A group of 18 workers came into contact with the cooperatives working in the region and Banca Etica, achieving a record-time funding of 3-400.000 Euros. The cooperative is now called Ora Office. The number of workers involved increased from 19 to 22. Starting off was not an easy task. A simple payment of the electricity bill was problematic at first. It is indeed a risky business sector, this for sure. There are several unsuccessful examples of similar projects, but this was a big investment that we decided to get involved in and we are happy we could play a role in the success of this project. Coop Magazzino is another example. 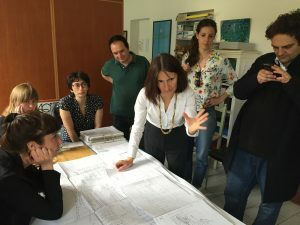 We visited the cooperative during the event Funding the Cooperative City that took place in the neighbourhood of Prima Valle, in Rome. 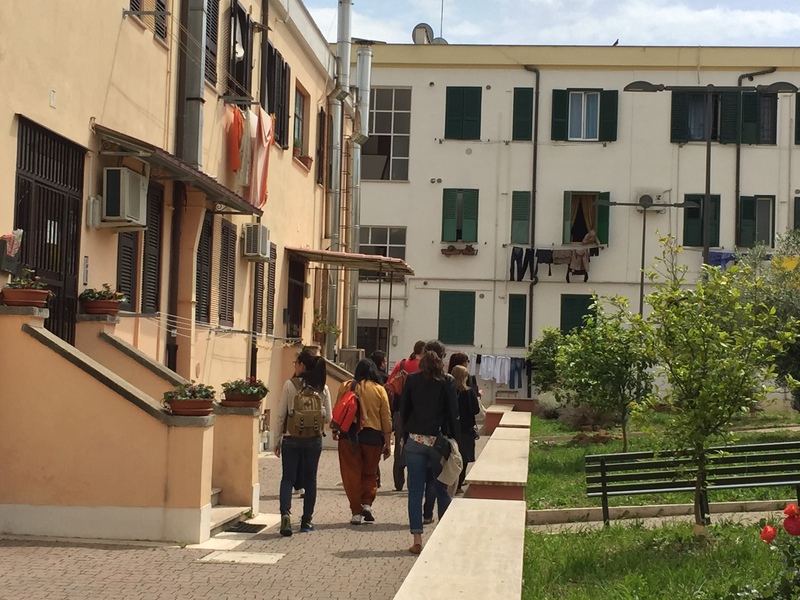 Coop Magazzino is a social cooperative that deals with the rehabilitation of disadvantaged personnel and the production of work through diverse activities such as mosaic, typography and furniture renovation. They mainly work with cases of psychological distress and they are really good at what they do. We decided to visit this cooperative during the event organized by Eutropian in order to show the example of a successful social project that relied on the financial assistance of Banca Etica. How did the launch of Banca Etica in Spain happen? Spain has witnessed the birth of a movement very similar to the one that brought to the funding of Banca Etica in Italy during the ‘90s. This movement is called Fiare and they started questioning the use and management of the funds for the development of the common good. Through common international contacts, Fiare has decided to become a partner of Banca Etica. As a consequence, all the members of Fiare have joined Banca Etica. Both Spain and Italy being part of the EU we had the chance to obtain the permission to operate in Spain without too many efforts. Also, what facilitated this manoeuvre was that Fiare has totally embraced our territorial organizational model. Hence they are also organized in GIT. We started off with a first branch in Bilbao, for the heart of the Fiare movement was in the Basque region, but we also dispose of representative and promotional offices in Madrid and Barcelona. How do the assemblies work after the launch of Banca Etica in Spain? We all work together. The principles on which Banca Etica is based are those of efficiency and sobriety. Through the help of regulations set by the administration of the bank, we found a way to organize two separate assemblies with a system of remote online voting. The two assemblies recently happened in Madrid and Padua and we were connected via videoconference with a system of simultaneous translation. We hope this experience in Spain will attract new partners, in Spain and in Europe. What are the parameters for the selection of the projects to support? There is a survey designed for each of the realities that ask for financial aid. There is one for associations, which is necessarily different from the one dedicated to cooperatives and companies. So, for each kind of organization we provide a survey that analyses major issues such as the system of governance (number of partners, number of meetings, governing body, gender representation and rotation in office), the environmental impact, the protection of labour (employment contracts) and eventual partnerships with third parties. Next to this general survey, every reality is then analysed according to its particular features. The final evaluation of the parameters analysed is made by the joint work of Banca Etica’s partners and the competences of specialized professionals. What are the future challenges that Banca Etica will face? On the whole, we are putting a lot of efforts in promoting Banca Etica, in order to get more members to join, especially among the younger generations. We are thus working in high schools and universities, so as to promote the Bank and to raise awareness on the need for financial education. More often than not, banks are not seen as positive actors and people tend to avoid them. The main problem is the continuous research for social capital and a low rate of participation. Economy, Rome , English, ethical bank, finance, Funding the Cooperative City, social cooperative.